The Spider-Man figure I reviewed today was not the only 6" Spidey figure available from the first movie - a few months after that series came out, Walmart released a second "Movie Edition" Spider-Man. It was kind of a stealth release, though, with very little fanfare or advance notice. In fact, the only way you'd ever know about it was if you happened to be looking at the unsold 6" figures and saw this new one in among them. For the most part, this figure is the same as the other one: a terrible costume, but sculpted with a lot of very small details done accurately; kind of the action figure equivalent of playing Guitar Hero and getting five stars on a Hoobastank song. The only differences are the hands: instead of a holding hand and a thwip hand, he has a fist and a gripping hand. Why did they redo him to give him these hands? Couldn't say. A better question would be why, if they had all these hands available for this mold, didn't one figure have them all? That's the only sculptural difference, but the real changes come in with the accessories. Most importantly, the interchangeable unmasked head! That's right, this Spidey is showing his Peter head. The likeness of Andrew Garfield isn't great - he looks too serious - but they did a nice job capturing his stupid One Direction haircut. The weird part is the highlights in his hair seem to be done with metallic paint, rather than just using a lighter color. Huh? 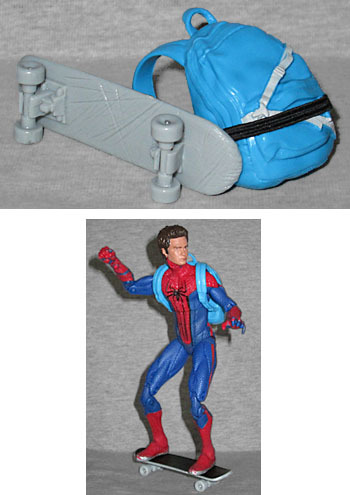 Rather than any webs, the only things this Spider-Man carries are clearly meant to be Peter Parker's: he has a blue backpack and a black and gray skateboard. The board is all scratched up on the bottom, and has rolling wheels. The backpack has an elastic strap to hold the skateboard in place. They're both decent pieces with more details than you would expect to see, but they look out of place on Spider-Man. Makes you wonder if Stan Lee's clothes would fit on this body, to actually complete his look. 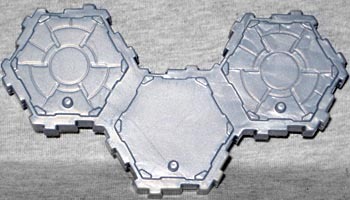 He also gets the Heroscape base that Hasbro was giving figures back then. Unmasked figures are fun, but this would have been better with a civilian body to actually be Peter Parker, not just Spidey with his mask off. If it at least had a webline or alternate hands, we could at least say that this one is better than the normal release, but a super-plasticky pink face isn't enough to push this into the win column. This entry was posted in addendums, blog exclusive review, Hasbro, Marvel, Walmart and tagged Spider-Man. Bookmark the permalink. Remember when the original Spider-Man came out, and we got a full fledged movie line, with the villain, the villain's secret identity, Peter Parker, Mary Jane, and J. Jonah Jameson? Yeah, those were the days. And fancy chair! That talked! AND it included a line that wasn't even in the movie! "The world will be yours and mine!" "Can Spider-man come out to play?" Get to reviewing those figures, STAT! As J Jonah Jameson would say, I want reviews of Spider-Man (toys)!!! !